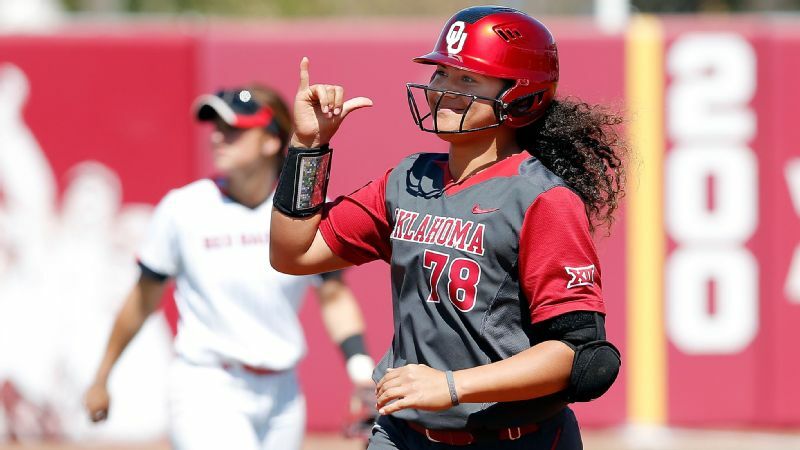 Jocelyn Alo hit 30 home runs last season for Oklahoma -- as a freshman. Oklahoma sophomore Jocelyn Alo hit 30 home runs in her freshman season, tying records for the Sooners, the Big 12 and the NCAA. After three wins against Kansas this weekend, Alo and the Sooners are currently sitting on the longest winning streak in the nation at 28 games. The team will head to Austin, Texas, for a three-game series at Texas starting Thursday. Alo gave us the scoop on the mellow songs she likes listening to these days. "Most times I like to listen to slow songs in the morning, just to get me relaxed and all that," she says. "Just songs I can vibe to. "When I get on the bus I do like to listen to more upbeat songs to get me going. But when we start warm-ups and all that, I like slow songs to bring me back down. I'm not a big rah-rah person when I play."